The Spanish cabinet has issued a decree making it easier for companies to relocate their legal headquarters away from Catalonia. Such a decision will now not need the prior approval of shareholders. One of the region’s biggest lenders, CaixaBank, has decided to move its headquarters from Barcelona to the city of Valencia. Another major Catalan bank – Sabadell – decided on Thursday to shift its legal domicile elsewhere in Spain. The economy ministry said the decree was in response to demand from companies “in the face of difficulties that have arisen for the normal running of their activities in part of the national territory”. The International Monetary Fund’s (IMF) country head in Spain, Andrea Schaechter, has said tensions in Catalonia could affect confidence and investment decisions. However, the IMF has kept its growth forecast for Spain this year unchanged at 3.1%. 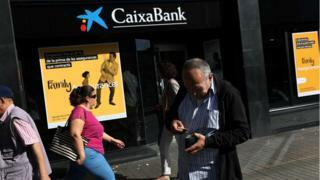 Sabadell – which is the second-biggest bank in Catalonia and the fifth largest in Spain – said it had decided to move its legal base “in order to protect the interests of our customers, shareholders and employees”. It said it wanted to operate “under the supervision of the European Central Bank and the regulations of the European Banking Authority”, something that would be removed were Catalonia to declare independence. The European Union has said it will not recognise an independent Catalonia, which would mean the region would not be subject to EU rules nor protection. Italian asset manager Banca Mediolanum followed Sabadell’s move, saying it would shift the legal base of its Spanish unit to Valencia from Barcelona. Catalonia accounts for a fifth of Spain’s economy, with factories for companies including Volkswagen and Nestle based there, as well as containing Europe’s fastest-growing sea port of Barcelona. Volkswagen briefly stopped production on one line at its Seat plant in Catalonia when protests disrupted the supply of parts. Stoppages also affected production at Nestle’s instant coffee plant in Girona. The Catalan business lobby Cercle d’Economia has said it is extremely concerned by the prospect of Catalonia declaring independence and has called for leaders from both sides to hold talks. Dutch paint maker Akzo Nobel, which has several plants in Catalonia, said it was monitoring developments. Spain’s constitutional court has suspended next Monday’s session of the Catalan parliament, in a bid to pre-empt a possible push for independence.